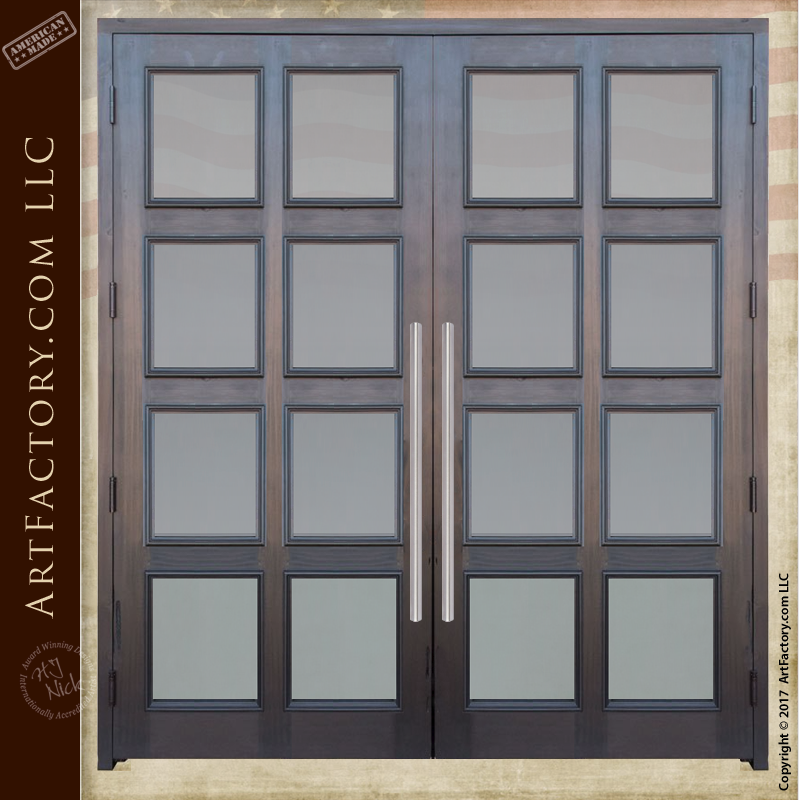 Make a great first impression that speaks volumes, with French entrance doors from ArtFactory.com. Contemporary styles have been around since the French Renaissance in the 15th century. These designs are still big part of design in the 21st century. These modern style, French inspired doors feature an 8 panel design, with divided thermal glass panes. These fashionable glass panel doors feature an ebony stain on the main frame as pictured. This is just one of our over 400 designer stain colors you can choose from. Our expert craftsmen hand rub our wood finishes to fine art quality, using a multi-step process. This process blends the stain into the grain of the wood for a long lasting finish that won't flake, crack, and peel like painted on finishes. At ArtFactory.com, we build high end, solid wood doors, to stand the test of time. Our combination of top quality, all natural materials, and master craftsmanship allow us to product a quality of product that is unmatched anywhere at any price. Our master builders hand craft the doors from solid, thick, naturally air cured, full length timber. These doors feature then same quality and durability found on castles, and manor houses around the world. Our custom entrance doors are built using age old, tried and tested techniques such as mortis and tenon joinery for a quality of construction that won't be found at any big box retailer. Don't settle for low quality, mass production doors, protect your home with fortress strength doors from ArtFactory.com. The custom, hand forged wrought iron door pulls are sleek and stylish with a highly polished finished. As with all of our custom door hardware, these door pulls are hand forged by master blacksmiths using fire, hammer, and anvil. In addition, we craft all of our custom hardware in solid wrought iron. Wrought iron lasts for centuries, and doesn't corrode with exposure to the elements like cheap filler metals. Designs such as these stylishly designed door pulls are a trademark of our master designers. In addition to the fine art door pull, the custom, contemporary style wrought iron hinges provide the perfect finishing touches to this door's state-of-the-art look. As a result, these French entrance doors will provide you with a custom entrance that is on the cutting edge of style. Renowned artist and designer H.J. Nick ensures that all of our products are built to world class fine art specifications. In fact, every product that leaves our factory is certified with the H.J. Nick signature, thus ensuring future appreciable value as fine art in antiquity. Every home owner needs at least one custom wooden door that he or she can truly cherish. That is why we offer our products at factory direct pricing, and create them custom made to order. These French entrance doors are a true display of style, security, and elegance all in the same package. The glass panels are thick, insulated, tempered glass for added security. We offer dozens of different varieties clear, tinted or deco glass to choose from. We even offer genuine, hand cut, kiln fired stained glass for those needing a more artistic look, and bullet resistant glass for those in need of another level of security. Our master-level craftsmen build each custom entrance by hand using tried and tested methods from antiquity. Expert wood workers, and blacksmiths use their classical training to build our products to historically correct specifications. Our techniques have tried and tested throughout history to a product that will last for generations. It is our belief that using the correct building methods and tools, is especially relevant when creating historic design. Furthermore, we will recreate any historic design, and build it to exact specifications at your request! When it comes to custom doors, the sky is the limit at ArtFactory.com. First of all, these French entrance doors provide maximum security. Additionally, we build to investment quality and fine art standards. We design all of our custom doors for either your residential, or commercial property. All doors are pre-hung in a structural cedar wood jamb that can be mounted to a typical metal store front. We can also build any of our custom door designs as custom gates or custom garage doors. Make a proper first impression, that reflects your personality and accomplishments, as kings, queens, and other aristocracy have done so, for thousands of years. At ArtFactory.com our expert craftsmen, wood carvers, and metal smiths individually create each fine art door by hand. We have no limitations on size, design, thickness, or finish. We hand make interior and exterior doors in any style, limited only by your imagination. All of our doors and gates are virtually maintenance free and more than surpass all hurricane codes worldwide. Contact us today at 1-800-292-0008 to get a quote for this French entrance door, or any of our other fully custom products. Were so confident in our fine craftsmanship, and the durability of our products that we guarantee everything forever.